When looking to update the look of your property or replace old fittings, there are so many different types of doors you can choose from. 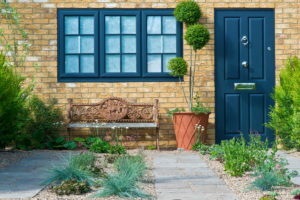 One of the most popular products installed are composite doors, but some homeowners want to know more before investing in these high quality products. Here’s our guide to some of the most common questions we get asked about composite doors and why they’re so popular with our customers across Surrey and London. Wooden doors were once highly popular for their sturdy nature and beautiful appearance, acting as the perfect fit for period homes as well as newer properties. However, the major drawback to wooden doors is the high level of upkeep required to maintain their condition and appearance. They may even need to be repainted on a regular basis and can be susceptible to damage just as any wooden products are. As a great alternative, composite materials which blend elements such as PVC, polyurethane foam and hardwood create a door which looks and feels like real wood, but has all the benefits which come with modern products. You can select composite doors for anywhere you like, but the most common place to install them is in your front door area. You could install a composite front door as part of a full porch makeover, a project to replace several of your windows and doors or as a standalone product. You may also opt to replace your front and back doors at the same time if you’re looking to reduce ongoing issues you have such as draughts or security concerns. If you use a reputable window and door company, they’ll be able to supply and install composite front door designs from top manufacturers which come with the functionality required for any property. This includes thermal efficiency for a warm home and high security features to stop would-be intruders in their tracks. Do You Have to Stick to One Style? Homeowners often worry that composite doors are quite traditional in appearance – think of your standard door with a knocker and letterbox. However, composite materials are completely versatile, creating a variety of looks, including contemporary, sleek looking doors which look great against the most modern and stylish of properties. You can also create unique looking doors by completely customising the look from patterned glass or solid panels to fanlights, hardware and an extensive selection of colours and finishing effects. This means whatever the style of your property, there are great options for you. Here at Merton Windows, we want to hear from you if you would like to see more examples of composite doors we offer to our customers. We cover a wide area, including homes and businesses in Richmond, Surbiton and Twickenham. Contact us for a free, no obligation quotation on all of our composite doors.